The Astara – Astara railway line connecting Iran and Azerbaijan will be inaugurated on Wednesday, 29 March. The line between the two cities of the same name has been one of the missing links on the International North–South Transport Corridor (INSTC), a 7,200 kilometer-long freight route connecting India, Iran, Azerbaijan and Russia via ship, rail and road. The 1.3-kilometer long Astara-Astara line will be inaugurated in Baku in the presence of the presidents of the respective host countries. The ceremony will also include the opening of the freight terminal, which is located in Iranian Astara. “Some cargo from Azerbaijan and Russia has entered the rail docks in Astara in Iran in the past month. The total weight of this cargo was around 7,600 tonnes of goods, carried by 122 freight wagons”, Iranian Railways (RAI) was quoted explaining in a media report of the International Union of Railways (UIC). 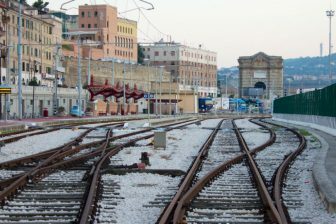 The right to operate the terminal as well as the railway line has been granted to Azerbaijan for 25, respectively 15 years, following Baku’s investment in both construction projects. The total cost of these projects was around 60 million dollars, RAI explained in the report. 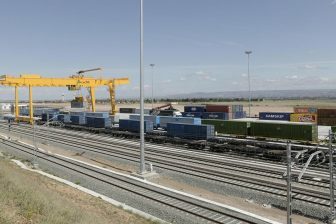 The total area of the Astara rail dock is about 60 hectares and includes official buildings alongside required facilities such as silos and oil depots, along terminals for general cargo and containers, according to Hossein Ashouri, former Head of RAI’s international transport committee. “At least five foreign companies have declared that they are ready to invest in the Astara rail freight terminal. The Islamic Republic of Iran is ready to accept foreign investors to expand the Astara rail freight terminal”, Ashouri was cited. Iran is responsible for two more lines on the crucial North-South Corridor: a line connecting Astara with Rasht and a line connecting Rasht with Qazvin. The Astara-Rasht is the longest section on the line, with 164-kilometers of railway connecting the Iranian cities. According to the latest reports, RAI is negotiating with foreign partners about the financing scheme of the project, totalling a cost of 425 million Euros. The Rasht-Qazvin section comprises of 163 kilometers of railway, of which the remaining construction work is expected to be completed by the end of 2018. 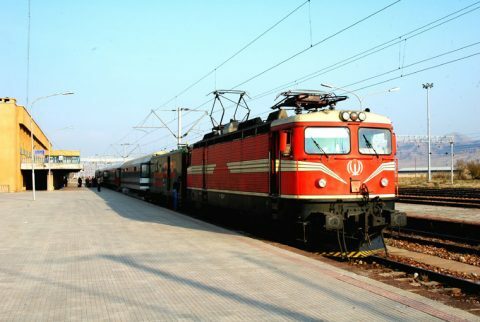 Once completed, the Rasht-Astara line will connect to the existing Iranian network with Bandar Abbas as its important sea port terminal and, in the north, to the network of Azerbaijan, with railway hubs in Astrakhan and Baku. The North–South Corridor will reduce journey times between Mumbai and Moscou from forty to fourteen days. Test runs have already been carried out, while a dry run was conducted last year. It is anticipated that in the future ten million tonnes of freight will be transported within the network. The main objective of the corridor is to provide an alternative to the traditional routes carried out by sea through the Suez Canal and the Mediterranean and the Baltic Sea.